What are those dark stains on my roof and should I be concerned? The stains are a airborne fungus called Gloeocapsa magma. Shingle formulas have changed over the years to include extenders like limestone, cellulose and other various wood products. Less and less petroleum and felt ingredients are being used. 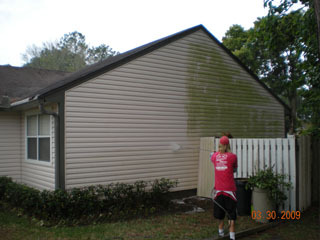 The unexpected results were destructive algae infestation (black stains) on millions of homes across America. The stains also attack clay tile and wood shakes roof material. Top 5 Reasons to have your roof cleaned! 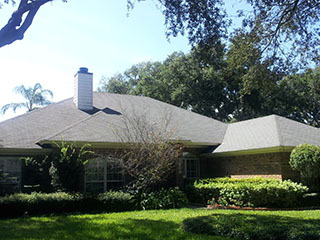 Shine Right specializes in killing the algae and fungus safely and effectively from roofs to restore its natural beauty. We use the latest state of the art equipment for the best results possible. we will remove the stains without removing your granules. WE DO NOT USE HIGH PRESSURE ON YOUR ROOF. 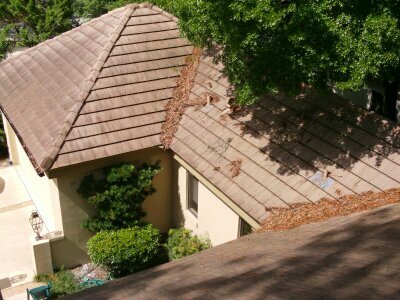 Pressure washing a roof with high pressure will do more damage than good. The granules on your roof is very fragile and high pressure is the worst thing for it. 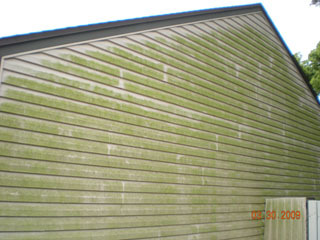 We will spray our special algae killing solution on your roof. Let it do its job and kill the algae. Then we will rinse off the algae and solution. We will not just spray your roof and leave. Like I said before, your shingles are delicate and leaving any type of cleaning product on them to bake in the sun is not a wise decision. We will spend the extra time to make sure all the solution and algae is off your roof. 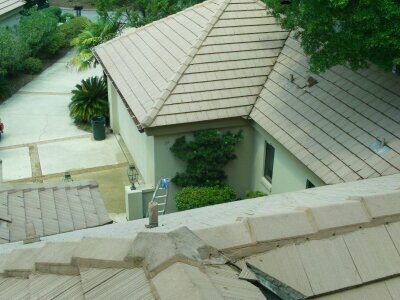 (We won’t just tell you we care; we will show you) Also we are trained on how to walk on all types of roofs. Last thing you want is someone stomping around on your roof when there is no need for it. 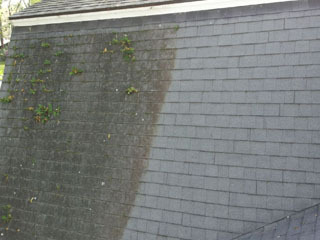 Roof cleaning takes experience and knowledge to be done right. We have both. 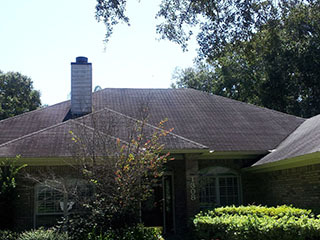 We have cleaned hundreds of roofs over the years with hundreds of satisfied customers. 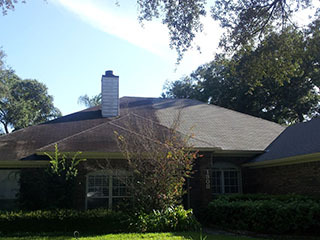 You will be amazed by the dramatic difference of a clean roof compared to a stained roof. living in these warm humidity climates is a feeding ground for mold, mildew and algae. It attacks all surfaces and will turn your beautiful property into an eye sore before you know it. Also oxidation, pollution and acid rain can take a toll on your home if not treated. If there’s mold, mildew, dirt, or stains on it. We will clean it. Before we start any job we first take the time to talk to the homeowner. We listen carefully to what their wants and needs are. We listen carefully to what their concerns are. Then we will answer all questions they may have. The most important part of any of our jobs are you the customer. All of our jobs start and finish with knowing the customer is informed, comfortable, happy and completely satisfied. 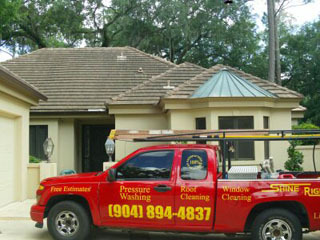 We understand that you want to get your windows professionally cleaned so you can have a shining exterior on your home. That is exactly what you will receive from Shine Right. 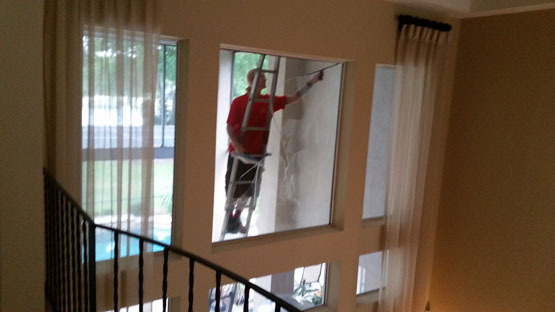 All of our employees have minimum of 10 years experience of window cleaning. Our main goal is to make you smile and your windows shine. 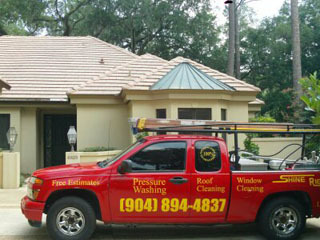 We will clean all your windows, tracks, frames and screens inside and outside. Everything is cleaned by hand to make sure you receive the highest quality cleaning possible. 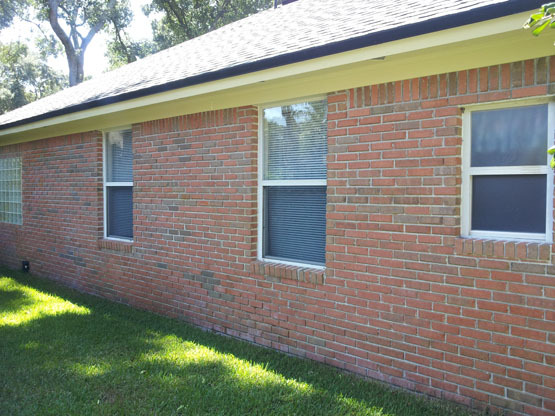 We start each window cleaning job by first listening to the customer for any questions or concerns they may have. Once all questions are answered and the customer is comfortable we will then start the cleaning. We will come inside to pop out all screens. (Any time we come inside your home we will always have shoe covers on). 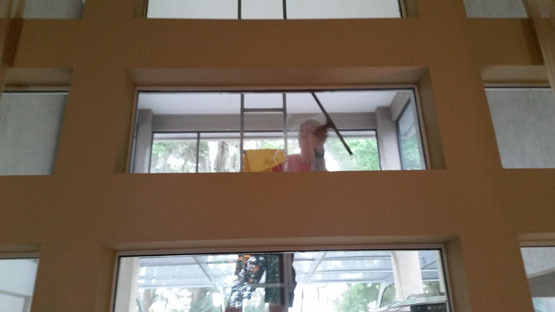 Once the screens are out we will clean the inside of your windows first. We are very careful to not make a mess and to put all your furniture back exactly the way we found it. If you have any mirrors, chandeliers etc. you want cleaned we will do that while we are inside. Once the inside is completed we will move to the outside and hand clean all your screens. We will then reinstall your screens and inform you of any issues we may have found during the cleaning. Shine Right is aware that you put a lot of trust in letting people inside your home. That is why every single employee is hand-picked by the owner and goes through a rigorous training process and thorough background check. This way you know you are getting the best, caring, experienced worker possible. We will show up at the time you scheduled us to be there. We know that you are paying for professional cleaning and that’s exactly what you will get. Over time your gutters will get full of debris that will stop them from working properly. When that happens it can cause serious problems. It can cause leaking behind the gutters into the walls of your home. It can cause sagging of your gutters due to the weight of debris. It can cause rain fall to run over your gutters instead of through your gutters. Any of these situations can spell trouble if not treated. 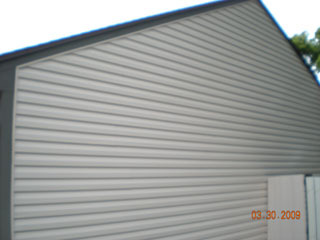 Shine Right will clean the interior of all your gutters and down spouts to remove all debris. 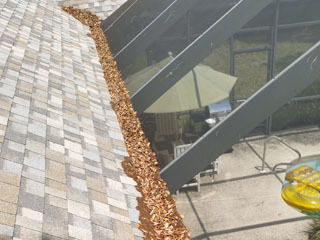 Once we have removed all the debris from your gutters and down spouts we will bag it up and haul it off your property. After bagging up the debris we will then run water through all your gutters and down spouts to confirm proper flow and check for any leaks. If we find any clogs or leaks, we will address the issue to make sure your gutters and down spouts are working like they should. Upon completion we will make sure you are completely satisfied and happy. If so, then we have done job right. Shine Right will seal any leak in your gutters or down spouts. 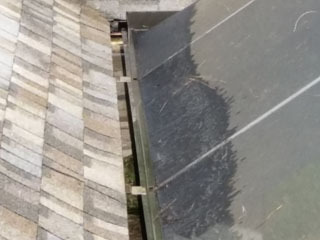 Over time gutters have a tendency to leak at the seams. 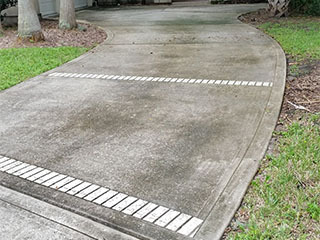 The leak can cause not only problems with proper flow but also stains on your driveway, walkway, pool deck etc. We will fix those leaks for good. All of our leak prevention is backed by a 5-year guarantee. If any leak we fix fails we will re-do it again. No questions asked. 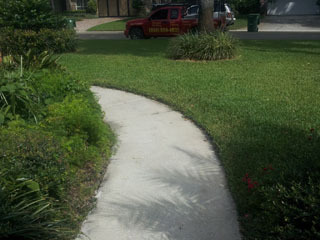 We strongly feel that your complete satisfaction is most important part of any job we will ever do for you. Therefore, we refuse to have any leaks in the quality of work we provide to you. 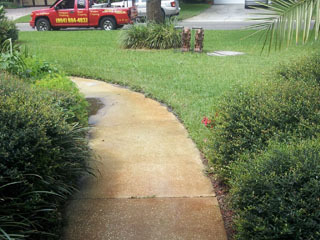 Do you have stains on your driveway, walkway or sidewalks from your sprinkler system? How about stains from fertilizer? 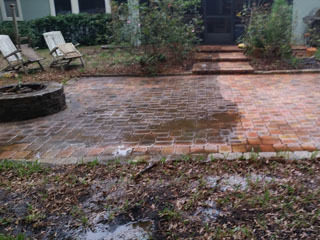 Do you have unsightly oil stains masking the beauty of your pavers? 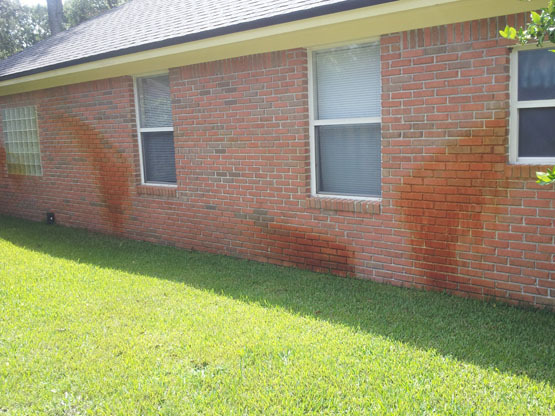 Do you have orange stains on your house? If so, then give Shine Right a call. We specialize in stain removal. 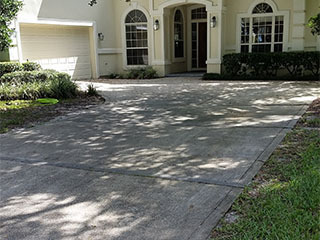 We understand that a stain can ruin the looks of your home, concrete, pavers, pool deck. We use the best stain removal to make sure the stain is gone and will not return. Give us a call and we will turn that stain into shine. Has your pavers started to fade in color? Or have they started to get big gaps between them? Maybe some have started to sink while others seem to rise up. Are there weeds growing between your pavers? Shine Right will solve any or all of those problems. 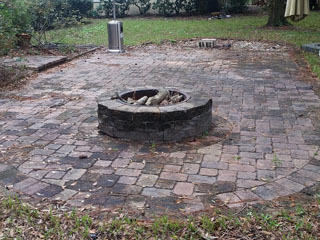 We will make your pavers look like new again. 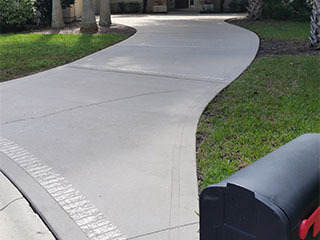 Did you know that by sealing your pavers you are prolonging the life of them? 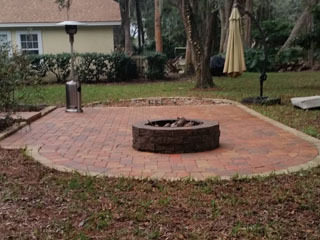 We know that it is a big investment to have paver installed. Why not protect that investment by having them professionally sealed? We will go over the entire sealing process from start to finish in detail with you. We will provide you with as much information possible to make sure we give you the results you expect. Paver sealing can be a tricky task. If not done right, it will cost you more money and time to have it fixed. I know that from personal experience. Shine Right will listen to you so we know what you want. We will give you the results you expect. We know that you are the most important part of any job so we will deliver the quality you deserve.